How to Choose a New Golf Bag – What Features Should You Look For? Home » Equipment » How to Choose a New Golf Bag – What Features Should You Look For? 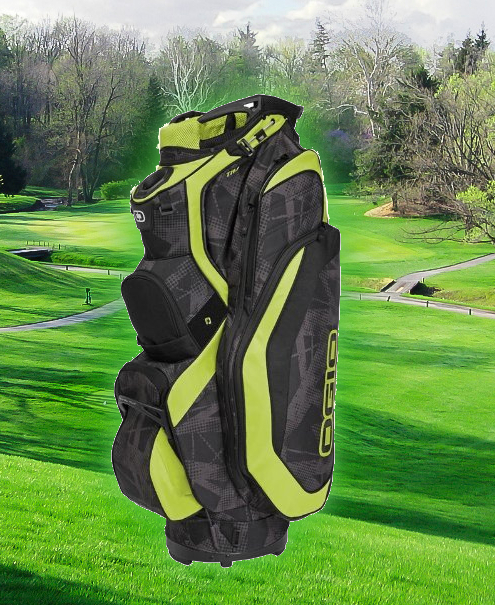 When looking for a new golf bag I found an overwhelming number of features to consider. I have written this post in an effort to help you understand a few of these or at least remind you what to look for in a new golf bag. One of the first things to consider is price. Sometimes bags can be expensive. Consider this, you will probably have this bag for more than 10 years. Amortize the price over the cost of 10 years and it doesn’t seem like so much. Also, look around. I found the bag that I wanted at a local shop (which I am very loyal to) for $295 but when I found the exact same bag on Amazon for $109, I couldn’t pass it up. Also consider purchasing in the fall. Sometimes you can find a very good bag at a discount just because they want to make room for new bags. While a golf bag won’t directly impact your score, there is something to be said for having everything right where you need it, when you need it. My old golf bag the inside bottom of the tubes were ripping and the material was grabbing the club and sometimes I couldn’t pull the club out of the bag. Sometimes 3 or 4 of the surrounding clubs would lift up as I was removing another club. Not only embarrassing, but frustrating and neither of those feelings help your golf game. Style; cart, stand or travel? If you primarily walk consider a stand bag and what the weight is. Will the stand mechanism stand (pun intended) up over time? I travel a lot with my clubs and needed to make sure my full cart bag would fit inside of my hard sided travel case (If you haven’t looked into the travel cases by SKB, you should. They are well worth the money). Another thing to consider with a cart bag is will it fit on the cart? My old bag was very wide and had huge pockets on the sides. Sometimes my playing partner’s bag and mine did not fit so well on the cart. I broke a pare of glasses cramming my bag onto the cart once. Where are the pockets and what purpose do they serve? Based on how you play, you probably know what you like to keep in your bag. Where will you put your new stuff in the new bag. Will it hold what you want? Think about valuables, cell phone, sunglasses, sunblock, balls, ball markers umbrella, extra gloves, does it have a beverage pocket? Where will you hang a towel and a club brush? Is it easy to get to tees and balls? 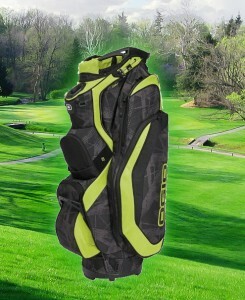 Most bags come with 14 tubes for clubs, where will you put your ball retriever? The new bag I chose has slots for 14 clubs AND a separate putter well. This gives me a nice location for a ball retriever. Are the handles in the right locations? Will you be able to pick up your full bag and put it in the trunk of your car. Look for a handle at the base of the bag to assist in this effort. Does the bag come with a rain cover for your clubs? It should. I hope I reminded you of a feature that is important to you when looking at golf bags.